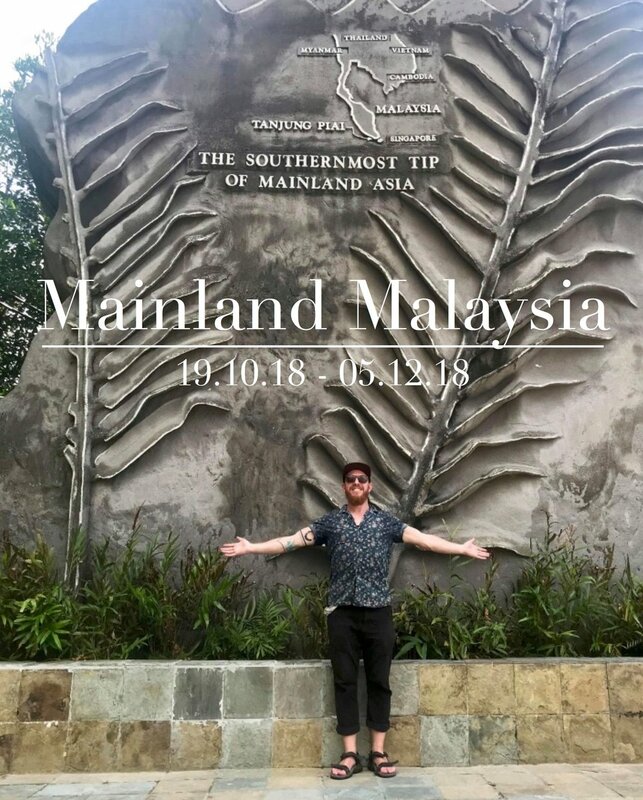 To say I was excited about visiting Malaysia would be an understatement; the echoes of “the food is amazing” and “cycling is very popular” feeding my excitement. Getting to Malaysia from Thailand is super easy, with numerous options. I’d only decided the day before that I would take the ferry direct from Satun, Thailand, to the island of Langkawi, where I could get my 3 month Visa On Arrival. I’d planned it pretty well to leave Thailand with no Thai currency whatsoever, so, having paid for my boat ticket, a reasonable 300baht, or £7.50, I felt a little awkward when the lady collecting the tickets when boarding asked for another 150baht for Surly Temple, with me raising my hands up in surrender saying, “I’m sorry, I have no money”. Considering the last two times I’d taken Surly Temple on a boat, she’d disembarked with a flat tyre, and especially as she was perched out on deck in the rain, I didn’t feel like I’d wronged anyone. Surly Temple perched out on deck. ….and as I got off, guess what? Yep, another puncture! Fortunately it was a slow puncture, so I gave her some air and made my way the short but very steep distance to Ramama, my Airbnb for the next 3 nights. RamaRama, an Airbnb property in Kuah, described as “ a tranquil getaway from busy streets and tourists” was exactly that, but even more so. After an out of the saddle ride in the highest gear possible, up a very steep hills, with extra supplies in the form of beer and water in tow, and the temperature in mid thirties and and the humidity through the roof, I arrived, absolutely dripping with sweat just from the short but aggressively steep hill I’d just climbed. Nurul and Odin, the owners, had told me that Matt, the host of RamaRama would meet me at RamaRama, and was surprised to be met by a young Mancunian in this remote property. 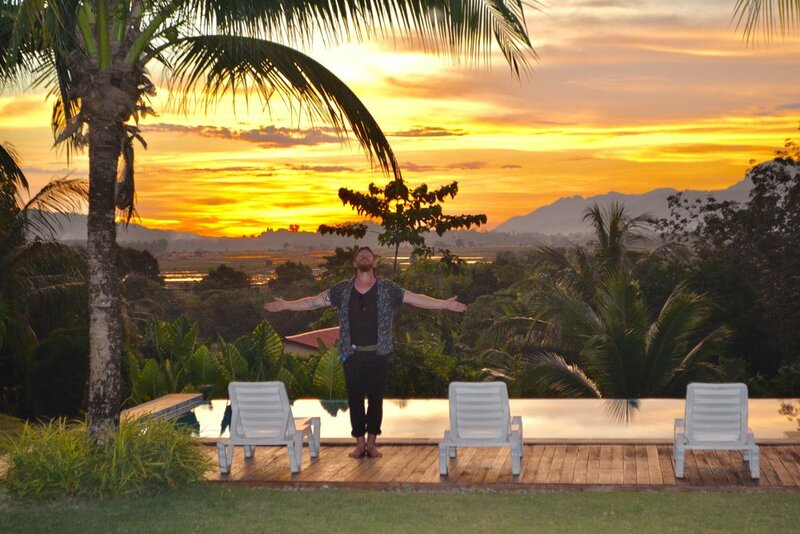 Matt had arrived at RamaRama 5 days before and was staying as a host/volunteer, whilst learning how to online trade to sustain a more nomadic lifestyle. We chatted and chatted, and after a 5am finish that night after a good few beers, I knew Matt and I were going to get on well. Langkawi Island, home to the worlds steepest cable car, National Geographic’s 8th best beach in the world, some incredible diving opportunities and amazing landscapes, is the first real island I’d been on, and I’m glad I’d waited for this. Having originally booked RamaRama for 3 nights, I soon realised I’d be stying there a little while longer than originally thought. Not only because this was one of the most beautiful and serene places in the world, where you wake up in the morning and meditate over looking these incredible views, to then open your eyes to the sight of the elusive Dusky Leaf monkeys staring at you from the trees, but because Matt, Odin and Nurul had been very welcoming, made me feel at home and had quickly become friends. One of the original reasons I’d only booked to stay at RamaRama for 3 days was because I’d seen that my friend Jess and her husband Mark where holidaying in Langkawi at the same time I was there, so having arranged to meet them, I made my way across Langkawi Island to my new Airbnb for a the next two days. With Langkawi Airport near by, Cenang beach is the most popular part of Langkawi for tourists, which is evident as I cycled through. Huge amounts of development and restaurants line the beach obstructing what would have been a great view once upon a time. I was quickly reminded of why I was avoiding this part of the island and choosing the more authentic Kuah instead. My Airbnb was an old fisher mans hut and provided a look into authentic life in a different part of the island. The following day I made my way to The Andaman Hotel where my friends Jess and Mark were staying. The ride was hot and sweaty with temperatures hovering around 34°, and undulating, quiet roads, meandering through the forest, and past the stunning Els golf course, made for a very fun ride. As well as the elusive and very cute dusky Leaf Monkeys, mention above, the not so elusive and rather troublesome Macacque can be found everywhere, and I as rode, these little buggers would be stood on the side of the road, staring at me. The Andaman Hotel, which takes it’s name from the sea it looks out upon, sits in the Datai Bay, voted by National Geographic as the 8th best beach in the world. With clear turquoise waters looking out over the sea, and 10 million year old verdant rainforest surrounding you, you can appreciate NatGeos accolade. The Datai bay with its turquoise waters and white sandy beaches. The Andaman Hotel is a 5* resort which is evident as you arrive at the entrance; it is stunning. On arriving, Jess and Mark welcomed me with smiles and we made our way straight down to the beach and straight into the sea. No need to change into my swimming shorts I thought, so it was straight in in my shorts and leggings. The 2004 Tsunami had decimated huge parts of the coral in the area which is estimated to be around 8,000 years old, so to hear that the bay had banned the use of motorised vessels to conserve the coral, was great. The coral reef actually played a vital role in protecting much of the Datai Bay during the tsunami, as it does everywhere, by acting as a barrier and absorbing much of the impact, and consequently saving lives. Soon we were sat enjoying a delicious lunch and great conversation over looking one of natures wonders. The chef Sankaran had come to our table to introduce himself, and it wasn’t long before we were having a great laugh with him. He seemed to take a liking to us, bringing us a few tasters of dishes on the house, and would do the rounds around the guest in the outside restaurant, then come back to chat more. I explained that I was a chef which he was delighted with. “Are you here for dinner?” he asked, I have some delicious food on the menu. With this, hours of conversation had passed and as the sun started lowering in the sky, I soon remembered I still had a 20km ride back to contend with. “Don't be silly, we want you to stay” they both agreed. And with that, lunch soon turned into dinner, and with the conversation still flowing and smiles all around, we watched the sun setting over natures stunning portrait. Sankaran the chef continued to come and talk to us, and by the end of the night, I was sat taking notes as he was reeling of recipes to me, as I sat there asking “ What’s in this? What’s in that?”. Jess and Mark very kindly and very unnecessarily treated me to an amazing lunch and dinner, which was very kind of them. Jess and Mark fancied a glass of red and so did I, and having spotted a Brunello Di Montalcino on the wine list, I wanted to show my thanks and gratitude. With a fuzzy head in the morning and not wanting to overstay my welcome, having slept on the sofa in their room, we said our goodbyes. It was so nice to spend time with them. For anyone wanting any leather goods, Mark has a fantastic leather goods business specialising in custom, handmade leather belts, and leather branding. www.markrusselleather.co.uk . I made my way back to RamaRama in Kuah, where I would stay for the next 3 weeks. Matt had a moped, and I soon became a frequent passenger, whizzing around Kuah and further afield, usually to go for food, and grinning from ear to ear with locals often wave at us and having a giggle at these two foreigners riding around their town. Street night markets are held everyday in Langkawi in a number of different locations. In Kuah, Wednesdays and Saturdays are market night, which meant only one thing, Murtabak, Satay Ayam (chicken), Ayam Madu, Samosa’s + more. Every Wednesday and Saturday, Matt and I would go down to the market, and we soon became friendly with a few regular stall holders there. “Ahh, hello my friend” we’d get as we made our way through the market. Where is the most flavour, in the meat, the sauce, or the thing it’s cooked on? On my third time to the market, the Murtabak lady held up five fingers and said “five” with a smile, as I approached. Ah Murtabak…. For those that don’t know, get in the know. Murtabak is a bready pancake, stuffed with a variety of things, but this particular one includes onion, potato, egg and chicken, with some spices, and is then fried. The stuffing mixture is made first by mixing all the filling ingredients and frying in a ghee. This is then portioned into good sized squares which you would happily eat on their own. The stuffing is then wrapped in the bread like pancake and fried in ghee, again. I didn’t say it was healthy. This Murtabak at this particular stall was without a doubt the best Murtabak I’ve ever had; nothing has compared. One thing I did find out, was that whilst excellent hot, when sat in the fridge over night, these things are incredible for breakfast, which is why I would order 5 and have them for breakfast over a few days, if they lasted. I like good breakfast, and I have my favourites, and this is now in the top 4 breakfasts. With the market providing Wednesdays and Saturdays dinner, and a few breakfasts and lunch a few days after, we had a few more favourites we frequented. Haji Ali was another favourite. “Hello my friend” we’d get as we walked into the open side Muslim restaurant. Haji Ali served the best Naan bread I’ve ever had which would arrive scaldingly hot, having come straight out of the tandoor furnace. Naan all round. It is a meal in itself as it comes with 3, small vegetarian curries. They also served a great Ayam Madu, a sweet and spicy chicken curry. As a Muslim country, the majority of local restaurants don’t serve alcohol, but they do serve ridiculously sweet drinks. Teh-o-ice, teh tarik and iced Milo being 3 very popular drinks that should come with a warning, they are so sweet. A regular lunch time visit was the Chinese hawker centre in the heart of Kuah. Round tables spread across this open sided room with ashtrays full of cigarette buts and bits of food on the floor for the cats to nibble on, it was awesome. There were about 7 different options here, ranging from noodle dumpling soup, rice and pork, or buffet, which you help your self to. Nasi kandar, a buffet that sits out and topped up for a good few hours over lunch which you help yourself to and pay for whats on your plate, is possibly the most popular Malay food experiences. Sup Corner was a local nasi kandar restaurant, and it just so happened to be 300 meters down the very steep hills from RamaRama. Sup corner was a very local nasi kandar restaurant that served excellent food. Grab a plate, load up and then someone comes, looks at your plate and gives you a price. Usually a price you are very happy with. The one thing all these restaurants have in common, as well as being delicious, is they are super cheap, with meals never costing more than £5. Nurul and Odin have a number of Airbnb properties over the island, each one having their own volunteer/host, like Matt. Nurul is half Malaysian and half Swedish girl, who’s family live on the island as well. Odin, her husband is half Iranian, half Swedish, and they are both super nice and would invite Matt and I for lunch and dinner with them, often picking up the bill, which was very kind. One night, they invited Matt and I over to another of their properties called Alamanda, also home to Nuruls parents. Alamanda, whilst not over looking the sea, has an equally impressive view. The sunset that night was outstanding and the company equally so. RamaRama has 5 rooms, one of those being a small house, and is popular with foreign tourists and Malays alike, which was great, as it meant there’d be new people coming and going from time to time, which was great. One particular young German couple, Vicki and Stephan, were really nice and the night they arrived, there was a Muai Thai fight in the local mall which we went to. According to Nurul and Odin, who also joined us, this wasn’t your usual thing here in Langkawi, and so it attracted lots of people. Vicki and Stephan had their own motorbike and as we left, the heavens opened up and we got absolutely drenched. We made our way to Alhamdulilla, a middle eastern restaurant know as the best restaurant on Langkawi by tripadvisor. Rami the owner, a Syrian man with one hell of a story was very friendly, and again, having mentioned I was a chef, shared a few of his recipes with me. Delicious food and a wonderful man with a heart wrenching story. You can’t go to an Middle Eastern restaurant and not have Hummus. Nurul and Odin had invited Matt and I, and the other volunteers (I felt part of the team at this point) on the mangrove tour, which is another popular activity to do on Langkawi. We jumped on Matt’s motorbike, and with the warm air blowing in our faces, made our way through the forests and small villages to the other side of the island and met up with the other volunteers who Matt had never met either. We had a short ride to where the mangrove tour started, and as we are riding along, Matt and I on Matt’s scooter, Adam and Senna a volunteer couple on another, Dillon, another volunteer on another and Nurul and Odin in a car, all of a sudden, just behind Matt and I, we here a skidding and a crash. We quickly stopped to see Dillon on the floor. We rushed over to him and although there was no serious damage to him, amongst others, he had a wound on his foot that was very deep and gushing claret. A few cars stopped and to help and eventually, Odin and Dillon jumped in a vehicle and made their way to hospital. So now there is me, riding this motorbike the rest of the way having just had it crash just behind, and knowing that the biggest cause of injury for backpackers in Southeast Asia, is motorbike accidents. Awesome. I made it and after chilling out and waiting for Dillon and Odin to return a couple of hours later from the hospital, we made our way on the mangrove tour, which was great. Back left to right. Odin, Nurul, Adam, Senna, Front Right to left Matt, me and Dillon, all bandaged up. 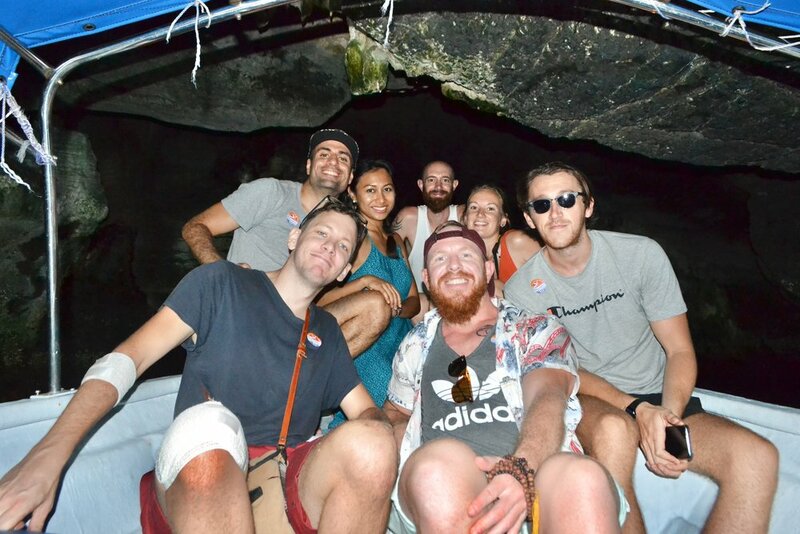 With 7 of us an the boat, we made our way into the Kilim Nature Park, where, surrounded by the huge amounts of mangroves, we got up close and personal with some friendly macaque monkeys( they do exist; lesson? Don’t tar every monkey with the same brush), fed some very large fish, got introduced to Archer fish, which are amazing. These fish fire water with pinpoint accuracy and knock crabs and other edibles off mangrove and trees into the water. An amazing thing we watched, was about 30 brown eagles soaring through the sky into the water in a feeding frenzy. We also walked through an eerie bat cave, with the ceilings covered in hanging bats. The next day, Matt and I decided we’d go up to Gunang Raya, the highest point on Langwaki, to watch the sunset. I hadn’t ridden for a while, and especially without panniers on, so I decided to ride up and that Matt would meet me up there. Gunung Raya peaks at 881 metres in height and its dense forest reserve houses numerous wildlife such as dusky leaf monkeys, flying foxes, macaque monkeys, squirrels, mountain hawk eagles, white bellied sea eagles, and great hornbills. I knew I’d cut it fine when I left RamaRama, but I still went for it anyway. The road weaving up is steep, and takes 30 minutes by car, so by bicycle, you can add 3 times that. I passed dusky leaf monkeys and macaques, with one particular group of macaques not liking me at all, with what looked like the alfa hissing, showing his teeth and leaping towards me which was not ideal as Im slowly cycling furiously up this steep hill. Matt had arrived and I told him about the aggressive monkey. He then explained to me that I shouldn’t make eye contact with them, nor smile at them and show my teeth. I knew I was going wrong somewhere. He carried on going, and I pushed on, until 1km from the top. The sun had pretty much gone now and the red sky was fading fast, but my attention had turned to just how dark it had got as I stood alone in this dark, dense forest. Huge bats started flying around me and noises started echoing around the forest, and sense that I was not alone came over me, and just like that, the forest came alive. Matt came down and by this time, it was pitch black. I had my bike lights and head torch and Matt followed behind. I didn’t hang around, and in fact, probably pushed it somewhat going down. As we sped down and around corners, weaving around the many toads that had now come out onto the road to party, flashes of wild eyes would appear in the forest next to us. It was all a bit hairy and nearly ended badly at the bottom as we were flying down and I didn’t see the nasty speed bump ahead until last minute which would surely have sent me flying, but managed to skid to a halt before hand. I knew I had completely underestimated the ride and the gradient as I cycled the 25km hills in the dark back to Kuah. Matt and I would spend hours, sitting out of a night, watching sunsets and the nightly lightning storm lighting up the sky and just sit and chat about all sorts of things. Just behind Ramarama is an old Chinese cemetery where we walked up one night and watch the sunset from. In the Airbnb listing, the cemetery is mention as a warning, because the Malaysian and Chinese people are so superstitious. RamaRama sunsets. Such a joy. For the only the 2nd time since I’d been away, I felt like I was in a place I could spend a lot more time, but, having been on Langkawi island for almost a month, it was time to leave and explore Malaysia. Matt, Nurul and Odin and had been so welcoming to me, I felt apart of the team, so it was cuddles all round when I left, but of all the places I’ve been to, I know I’ll be back on Langkawi again one day. Saying bye to this chilled out dude, Matt. There’s few places I’ve visited in the past year, and beyond that, that I’ve know I will return to, but Langkawi is one of those places, fate permitting of course. Skipping the islands of Thailand and waiting for Langkawi had been a great choice. Langkawi had been the perfect, gentle, introduction to Malaysian life. Next up, the rest of Malaysia. Again, thank you all very much for reading.